Alexandria, VA – January 21, 2013 — TransForce, Inc., an industry leader in providing professional commercial truck drivers on a temporary, contingent or contract basis and transportation compliance services, announced that it has acquired Superior Driver Source, Inc. and Superior Driver Source of the Carolinas (Superior). Superior provides commercial truck drivers in the southeastern U.S. with operations in Tennessee, North Carolina, Kentucky, Georgia, Mississippi and South Carolina. Superior’s senior management has joined TransForce’s leadership team and will assume key regional management roles, ensuring seamless customer service. Terms of the transaction were not disclosed. The Superior acquisition enhances TransForce’s ability to serve a wide range of customer needs within this region. Including Superior’s operations, TransForce serves over 40 markets throughout the U.S., serving national, regional and local motor carriers. 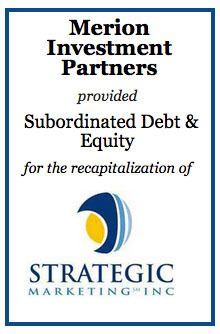 Future acquisitions are part of the TransForce growth strategy. “Traditionally, we have pursued a strategy of organic growth. We now plan to accelerate our growth trajectory by acquiring companies like Superior that provide quality professional drivers with safe operating histories to a broad range of customers. Our goals are to increase the number of markets we serve and to be the market leader in each and every market in which we are present” said David Broome, CEO of TransForce. TransForce was advised in this transaction by one of its equity sponsors, The Argentum Group, with financing provided by SunTrust Bank. TransForce was founded in 1991 and has operations in 26 states. TransForce specializes in providing quality commercial truck drivers to the transportation industry that includes trucking companies, third party logistics companies as well as private fleets. TransForce also offers department of transportation compliance services that include DOT audit preparedness, qualification file services and training, and federal motor carrier regulation education services. 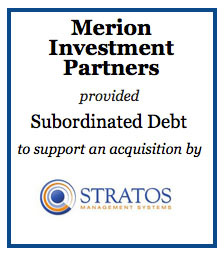 Merion Investment Partners provided subordinated debt and equity for an investment in Strategic Marketing, Inc. (“Strategic Marketing”). Wapato, Wash., January 10, 2013 – Amtech LLC, an industry-leading manufacturer of fiber-reinforced plastic components (“FRP”) for a wide array of industries, today announced the acquisition of Arrowhead Composites and Thermoplastics, an Elmore, Ala.-based division of Arrowhead Plastic Engineering, Inc., a FRP manufacturing facility serving the transportation, recreation, and utility industries. 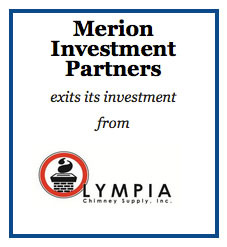 In 2012, Merion Investment Partners successfully exited its investment in Olympia Chimney Supply, Inc. (“Olympia”) via sale to a financial buyer.